On January 12-14, 2018, a conference in Baltimore on US foreign military bases brought together anti-war voices from all over the world. Speakers identified the many threats posed by United States military presence—from national sovereignty to the environment and public health. US military outposts in foreign nations are vestiges of a shameful history of US imperialism dating back to the Spanish-American War and subsequent US colonization of the Philippines and Cuba. Many more bases were built during World War II and the Korean War, and still exist today. The closure of these bases could signal the twilight of a long history of bloody, costly foreign wars while affirming the principle of self-determination for all peoples. Voices from Japanese, Korean, African, Australian and Puerto Rican resistance movements came together at the conference to draw these connections and plan a peaceful future. Fittingly, the conference marked the 16th anniversary of the opening of the prison at Guantanamo Bay, Cuba. Demonstrators gathered outside the White House on January 11 to demand the release of the 41 prisoners still detained without charges in the prison that former President Obama had promised to close. But as co-chair of the National Network on Cuba Cheryl LaBash said, “Guantanamo is more than a prison.” In fact, the Guantanamo military base is the oldest outpost of the United States military on foreign soil, with permanent control ceded in 1901 under the neocolonial Platt Amendment. The campaign to shutter the illegal and abominable Guantanamo prison coincides with the more protracted fight to return the bay to the people of Cuba. The history of Guantanamo shows how the barbarism of the modern war machine follows the dehumanizing logic of a century of US imperialism. The conference also devoted a plenary to the abysmal impact of both domestic and foreign military bases on the environment and public health. According to professor of environmental health Patricia Hynes, the majority of global superfund sites—sites the EPA identifies as posing risks to health or environment—are foreign military bases. Pat Elder from the group World Without War demonstrated how the Navy’s Allegheny Ballistic Center in West Virginia regularly leaks trichloroethylene, a known carcinogen, into the groundwater of the Potomac. The Naval War Center in Dahlgren, Virginia has been burning hazardous waste materials for 70 years. Though those bases are on US soil, “sovereign immunity” is all the more chilling of a verdict for the peoples of foreign nations.. Hynes described Okinawa Island as “the junk heap of the Pacific.” The island has been the dumping ground for extremely toxic defoliants like Agent Orange for several decades. Pollution from the island’s American military bases has caused hundreds of US service members and local Okinawans to become seriously ill. 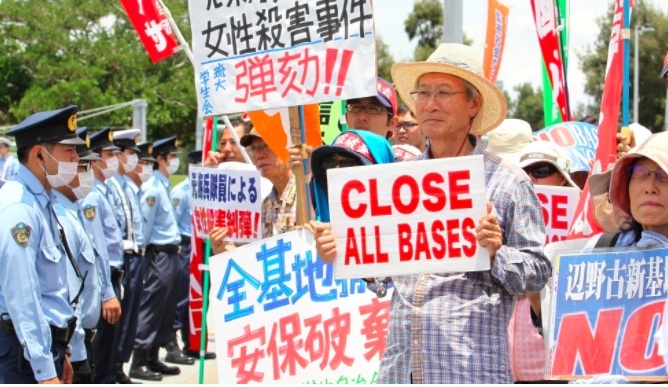 The people of Okinawa have been tireless in their fight against these deadly bases. While local resistance leader Hiroji Yamashiro awaits trial on trumped-up charges, protesters turn out every single day to oppose the expansion of Marine base Camp Schwab. Indigenous movements like these are the lifeblood of the international opposition to US empire. But fundamentally, it is incumbent upon Americans to rein in the devastating impact of their government’s foreign military presence. The conference concluded with a call for an international summit on foreign military bases to be hosted by one of the countries presently fighting against the US military presence on their soil. It also called for the formation of an ongoing international alliance against foreign military bases. For more information and updates, go to www.noforeignbases.org. [Editor’s note: Additional information is available in an earlier CPNN article. Dear Fellow Peace and disarmament advocates. Thanks to David Adams we can keep the UN initiative of the Culture of Peace alive and spreading out from headquarters to all nations and peoples. Since its inception programs showing the way that sensitive and brilliant artists have contributed to the movement by creating works that educate through various forms of artistry. The program, spearheaded by a coalition of NGOs and missions, was helped tremendously over the years by UNESCO and DPI staff and with the guidance and help of the U.N. press. I mention particularly Ambassador Chowdhury and Federico Mayor. We are launching an expansion of the program to Sarah Lawrence College in April, followed by other locales in the South and other colleges in the U.S. and Africa. We will advertise each event and the programs in hope you will develop it in other places all over. Youth today are into imagery and technology. Hopefully this will help them understand some of the more complex issuea and the SDGs confronting their troubled yet hopeful future. Thanks for supporting and attending.